New Pluto Pictures Are Out Of This World : The Two-Way Stunning new images of Pluto reveal a "bewildering" wide range of surface features and landforms. This view of Pluto is based on high-resolution images taken on by NASA's New Horizons spacecraft and shows a diverse and complex surface variety. This image, which shows the surface variety on Pluto, is "dominated by the informally-named icy plain Sputnik Planum, the smooth, bright region across the center." Today NASA released close-up images of Pluto that are as revelatory as they are beautiful. 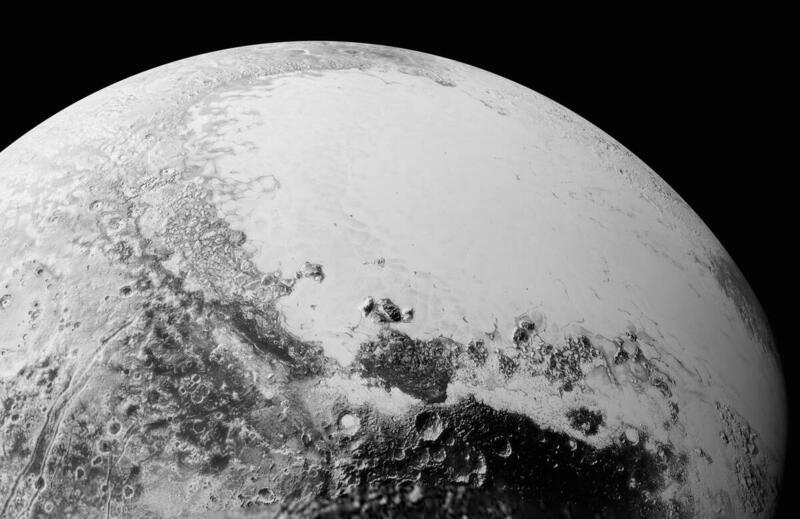 "Pluto is showing us a diversity of landforms and complexity of processes that rival anything we've seen in the solar system," said New Horizons Principal Investigator Alan Stern, according to NASA. "If an artist had painted this Pluto before our flyby, I probably would have called it over the top — but that's what is actually there." "New Horizons began its yearlong download of new images and other data over the Labor Day weekend. Images downlinked in the past few days have more than doubled the amount of Pluto's surface seen at resolutions as good as 400 meters (440 yards) per pixel. They reveal new features as diverse as possible dunes, nitrogen ice flows that apparently oozed out of mountainous regions onto plains, and even networks of valleys that may have been carved by material flowing over Pluto's surface. They also show large regions that display chaotically jumbled mountains reminiscent of disrupted terrains on Jupiter's icy moon Europa. "'The surface of Pluto is every bit as complex as that of Mars,' said Jeff Moore, leader of the New Horizons Geology, Geophysics and Imaging (GGI) team at NASA's Ames Research Center in Moffett Field, California. 'The randomly jumbled mountains might be huge blocks of hard water ice floating within a vast, denser, softer deposit of frozen nitrogen within the region informally named Sputnik Planum.'" 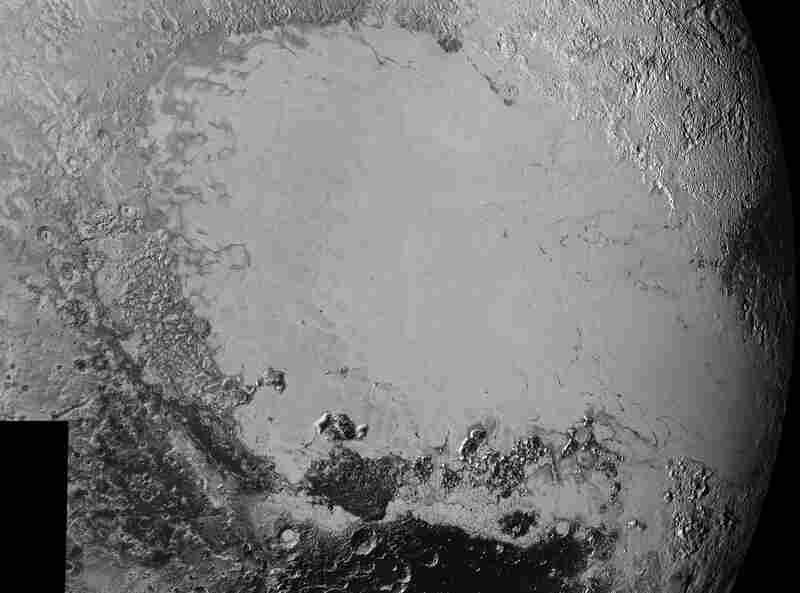 See all of the new Pluto pictures here. Follow NASA on Twitter to see photos on Pluto's moons that will be released Friday.